"Nail Art is my NEW-est Passion" and I am all in all into it these days, my regular readers know that :p When Born Pretty Store sent me few Nail Art goodies to try and review I was more than happy. One of the goodies is the very basic Nail Art tool: 2 way wooden Dotting Pen Tool. My Nail Art collection was lacking one and I know how much I missed it, only after using it so here is my experience along with a pictorial. 4. You can use this useful tool for creating a marbling design, blending colours, creating swirls and textured finishes. It can also be used for creating dots - of an even or decreasing size - and to pill dots into petal shapes when doing finely detailed flowers. A dotting tool was missing in my Nail Art collection, when I got to try 2 Way Wooden Dotting Pen Tool from Born Pretty Store I was happy and excited. As this is the very BASIC tool for Nail Art but the base is very important as we all know. Many Nail Art designs can be created with this tool alone. You can add Large or small dots and even make flowers, or leopard print and many more. It totally depends on your skills and creativity what wonders you can do with this tool, alone or combining with other Nail Art tools and decorations:). I am loving this 2 way tool in very affordable price, do check the discount code in the side bar. I created five little "Mani-Painting" using this single tool, have a look and Bless me with you comments. On white base I added large neon pink dots and around it added many dots to give it a look of Dotted Flowers. Ivory base, added Maroon elongated dots with large dotting ball, bordered them with black and then added yellow and orange spots with smaller dotting ball. 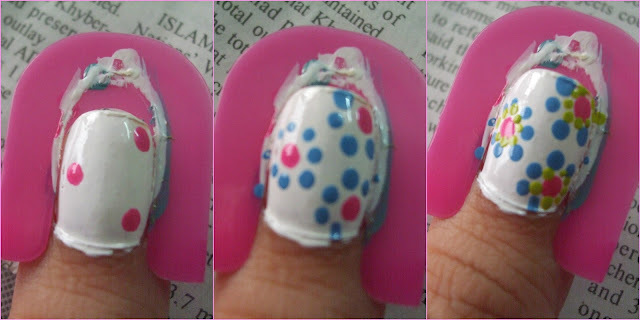 On my Middle finger I added Pink base then added small dots of different shades on the side of tip giving it a moon curve. On my Ring finger I applied my turquoise nail color, then added white Bigger dots and finally added Blue dots into the White dots. 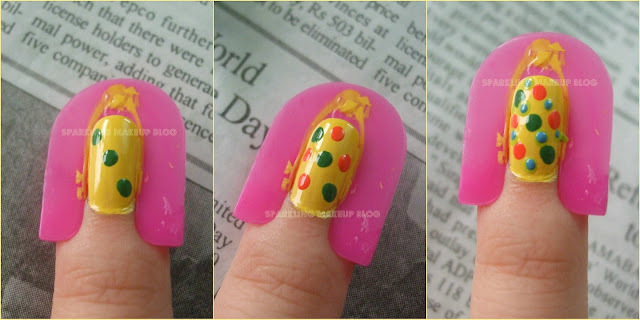 For my small finger I chose a yellow base colour and dots of green and orange to give it a total disco look. Here is the Final Look, Hope you like it! I used Nail Colours from my Sweet Touch Nail polishes and HSY from Luscious. Five Mani-Painting Dot dot Dot! 2 Way Wooden Dotting Pen Tool costs 0.99$. Do check Born Pretty Store website for free shipping worldwide. Use 10% discount code "LWJ61". 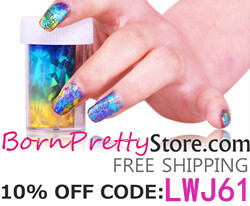 Join Born Pretty store's Facebook fan-page for more updates and latest Nail Art and beauty products. It's always good to read about online shops on blogs because I wouldn't dare trust them otherwise.